With Butcher’s Broom & Grape Seed Extracts plus Rutin. SKU: LAM8551. Category: Horse Chestnut. 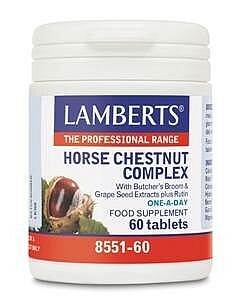 Lambert’s Horse Chestnut Complex is a unique formula that combines 4 herbs in just one tablet. Horse Chestnut (Aesculus hippocastanum) Seed is included at a full 300mg in this formula. It has a long history of use in traditional herbal medicine and is widely recommended by practitioners today. Butcher’s Broom (Ruscus aculeatus) is a native Mediterranean plant that is well regarded as a suitable partner to horse chestnut seed and we have added a significant 112mg. Extracts of the seeds of European grapes contain one of the richest sources of anthocyanidins, from the bioflavonoid family, and we have incorporated grape seed extract in our product. Anthocyanidins have been identified as being particularly active in supporting and repairing collagen rich structures in the body. Collagen is manufactured in the body and has many roles including being a structural part of capillaries, veins and arteries. When collagen becomes weakened, this can give rise to health problems associated with damage to blood vessel walls. Like anthocyanidins, rutin is one of the most well-known bioflavonoids and this has also been included in Lambert’s Horse Chestnut Complex. Take 1 tablet daily with a meal. Do not exceed recommended daily dose. Food supplements should not be substitute for a varied diet. Disintegration Time: Less than 1 hour. Suitable for vegetarians. The following list of allergens are excluded: Wheat, Gluten, Barley, Soya, Eggs, Milk and milk products, Lactose, Nuts, Sulphites, Celery, Fish, Shellfish and Yeast. This product is not recommended for pregnant or lactating women. To be stored in a cool, dry place and protected from light. Tableted With: DiCalcium Phosphate, Cellulose, Tablet Coating (Polydextrose, Colours: Titanium Dioxide & Iron Oxides, Hydroxypropyl Methylcellulose), Crosslinked Cellulose Gum, Silicon Dioxide, Stearic Acid, Magnesium Stearate.